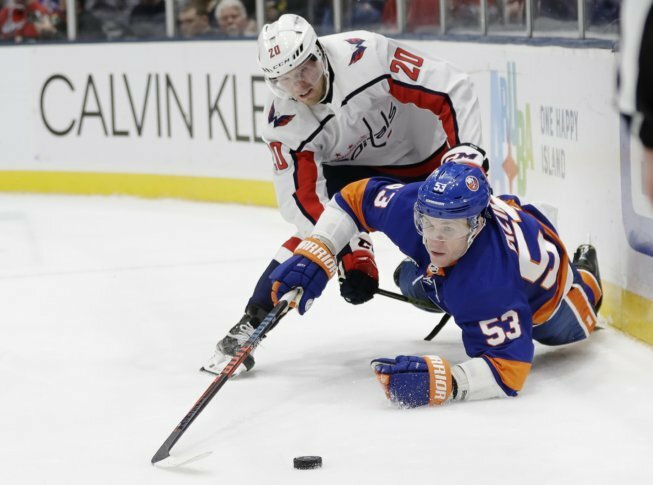 After being blanked 2-0 the last time these two teams met, the Washington Capitals saw a similar start to Friday's matchup, but ultimately, things took a turn for the better as they came out of Long Island with a 3-1 victory. After being blanked 2-0 the last time these two teams met, the Washington Capitals saw a similar start to Friday’s matchup, but ultimately, things took a turn for the better as they came out of Long Island with a 3-1 victory. A rough start plagued the Capitals yet again, as Tom Kuhnhackl capitalized on a turnover by Dmitry Orlov to make it 1-0 less than three minutes in. Although the Capitals would respond with a number of scoring chances, the Islanders still carried their one-goal lead into the second period thanks to Thomas Greiss. The Capitals struggled against Greiss throughout the second period, but finally, in the first four minutes of the third, Jakub Vrana kept his hot streak alive and tied it with his 19th of the season to make it 1-1. He’s now riding a three-game point streak. Minutes later, Alex Ovechkin would capture his 45th of the season on the man advantage to give Washington the 2-1 lead. He now has 10 seasons with 45-plus goals, the most by any player in NHL history. With the win, the Caps are now tied with the Islanders for first in the Metropolitan Division with 81 points. Hagelin and Jensen: How the Caps’ new players adjusting to D.C.